Horned Rat Gobbo VI was run over the weekend here in Wellington. And when the dust settled there was much rejoicing in Skavenblight as the ratty juggernaut delivered a 1-2 finish. Graeme's Elves are a beautiful army and everyone here locally enjoyed the opportunity to see them in the flesh. John Murrie showed the rewards you can reap when you discard Dwarfs and embrace Warhammer. A special mention for Tane and his "moving" Dwarfs. Isn't it interesting - and ultimately more successful - when you venture out of that 12" square in the corner of the board. Thanks to all the players for their attendance, especially those who traveled to get here. Also thanks to those who helped move tables - greatly appreciated. And a big thank you to Raymond for his efforts before and during the weekend with the organisation and umpiring. It was another excellent tournament, thanks for organising it. I'm glad I went. Congratulations on taking first too Pete, another well deserved win. Graeme definitely deserved best painted, and I played John M who I thought deserved best sport. 'Moving' Dwarves were pretty cool, and I enjoyed playing them. It helped that the Anvil rarely misfired and didn't detonate. 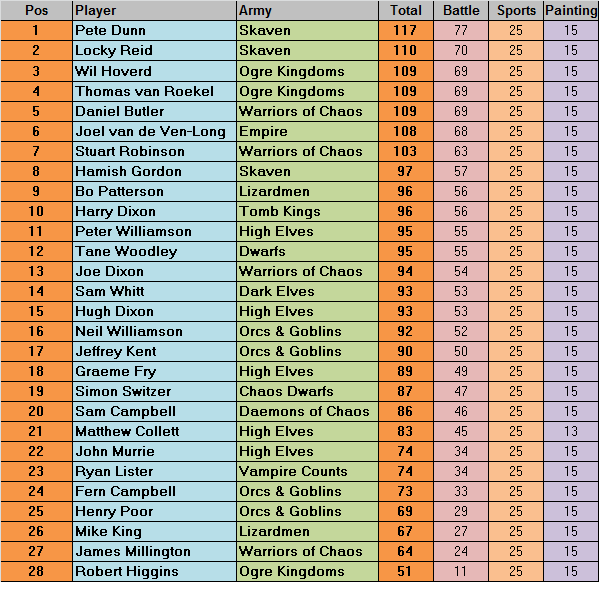 I did come 4th at Runefang with the usual 5 war-machine list, rather than 12th, so I'm not sure it's more successful. I think I'll play it again though, if only to see the look on people's faces as they get outmaneouvred by Stunties.